If you've been pinning like crazy like me on Pinterest, you'll have seen a zillion combinations of pretty wreaths out there to make for Christmas. Like these ones. 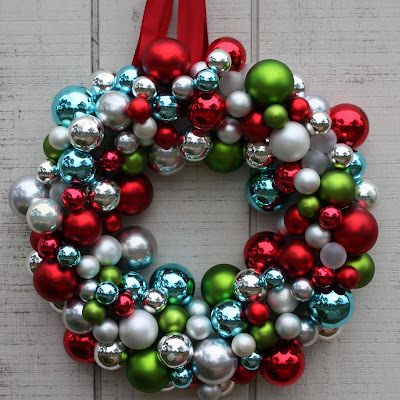 I loved the idea of a wreath made totally from baubles (to begin with anyway) and so started with this as my inspiration. However, upon closer inspection and a bit of rough calculation, I realised that a wreath like that would use an AWFUL lot of baubles = an AWFUL lot of time and money! So I came up with my own version. So still not that cheap to make, but something that will last for years and years to come. If you were cleverer and more patient than me you'd have waited till after all the Christmas sales and bought everything when it was discounted to make for next year. But was there any chance I was gonna wait another year to make this? Like heck! This was very simple to make but it was a little time consuming waiting for the glue to dry. 1. Wind the two lots of tinsel around the foam ring evenly and attach with either tape or glue. 2. Remove the string and bauble holder that the string is attached to. 3. Using a hot glue gun (and I christened my own hot glue gun for the experience I might add....so blimin addictive), put glue around the open hole of the bauble and connect this firmly to a spot on the polystyrene ring. 4. Hold firmly in place until the glue is fairly well set and the bauble isn't moving around much when touched. This is a good minute or two! 4. Repeat about 20 times using all the bigger baubles. This is the bit that takes the most time standing there holding the bauble onto the ring until it's set! It's best to do this when you have a good hour up your sleeve and no little people nearby demanding you play cars, wrestle, build lego, or play a board game etc! 5. I found the little baubles were much easier to secure, and could just be glued into the tinsel as they were lighter and didn't need to be secured to the ring itself. 6. Once the glue has fully dried, find a lovely spot to hang your wreath in the house and sigh a happy sigh as the first Christmas creation of the year brings the joy of the season ever closer. Looks beautiful! I love your red couch too :) You're so creative! Beautiful Meghan and a neat idea to hang it inside above the mirror - it looks even more spectacular with the added reflection and your red couch is gorgeous!